We’re back at the Power Mac Center Spotlight for our monthly dose of PWR Live! But this time, it seems that we’ll be seeing quite a few familiar faces outside of the PWR roster. The “Yakuza Assassin” Tengu is back as he aims to take some gold away, challenging the newly-crowned PHX Champion Jake de Leon in the main event! Speaking of defending their gold, the Kampeon ng Pilipinas Ralph Imabayashi sees to continue his winning ways as he takes on Quatro, who definitely has nowhere to go but up. Missing this afternoon’s show? 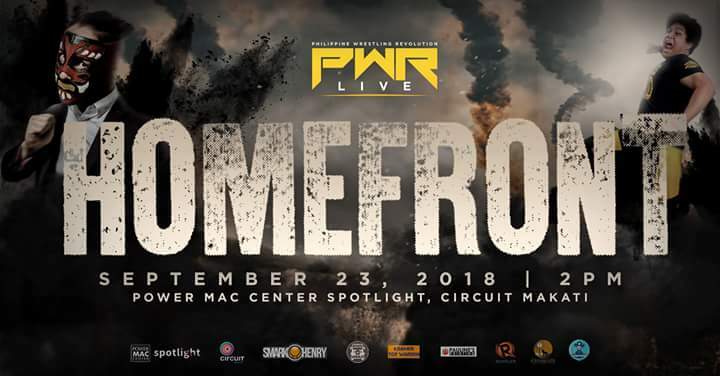 Keep checking this page as we bring you live results of PWR Live: Homefront! Brad Cruz, Bolt, and Revo-Ranger def. McKata, Samoan Papa, and Ninja. Jan Evander attacked the winning team post-match. John Sebastian def. Robin Sane of MWF with a Killshot to retain Sebastian’s share of PWR. Dax Xaviera def. Main Maxx via rollup after he attacked Maxx's knee with a wooden stick. YOLO Twins def. GrabCamus and Kap Tutan with a Two-Night Stand on Camus. The YOLO Twins came out in casual gear because they didn't want to do their match. The match began anyway when Camus attacked Yohann after asking Kap to kneel in front of him. Ken Warren def. Crystal with a schoolboy pin to earn a PHX Title opportunity. John Sebastian came out singing "I Want It That Way" mid-match. Mike Madrigal def. Vlad Sinnsyk after Sinnsyk passed out from a crossface-sleeper. Trian dela Torre and Evan Carleaux (c) def. KakaiBros to retain the PWR Tag Team Championship with a Friendship Beats All on Kh3ndrick. Two of KakaiBros' Hypebeasts were the YOLO Twins in disguise and they dragged the referee when Kh3ndrick was mid-pinfall attempt. Mh4rcki3 chased them away and left Kh3ndrick to finish the match. AB3 (c) def. Mainstream Mahaba in a baking pan match to retain the All-Out War Title. Martivo def. SANDATA with a rollup. Mr. Sy came out to offer SANDATA a slot at the Mr. Sy Group of Talents (MSG), which SANDATA accepted. Ralph Imabayashi (with Mainstream Mahaba) (c) def. Quatro with a surprise pinning combination to retain the PWR Championship. Mahaba interfered mid-match and tried to hit Quatro with the PWR title but he accidentally hit Imabayashi. Mahaba's PA tried to interfere as well. Quatro pinned Imabayashi for the 1-2-3 BUT THE REFEREE REVERSED THE DECISION with Imabayashi's foot under the ropes! The match continued with Imabayashi hitting the Senketsu and pinned Quatro for the win. Post-match, Imabayashi told Mahaba that he wasn't of any help to his title defenses. Mahaba dismissed this discussion. While Imabayashi was on his way out, a masked man attacked him and was revealed to be Mike Madrigal! Chris Panzer def. Ladykiller with the Eagle Splash. Jake de Leon (c) def. Tengu with the Inasal Lock to retain the PHX Title. After a show of respect between the two, Tengu attacked JDL post-match. Ken Warren made the save and attempted to hit JDL with the title. Chris Panzer stopped him but both him and Warren got a superkick from a conscious JDL. That's it for PWR Live: Homefront! Potential matches are brewing up for PWR's next show on October 21st. Which potential match-up are you most excited about? Sound off in the comments section below!